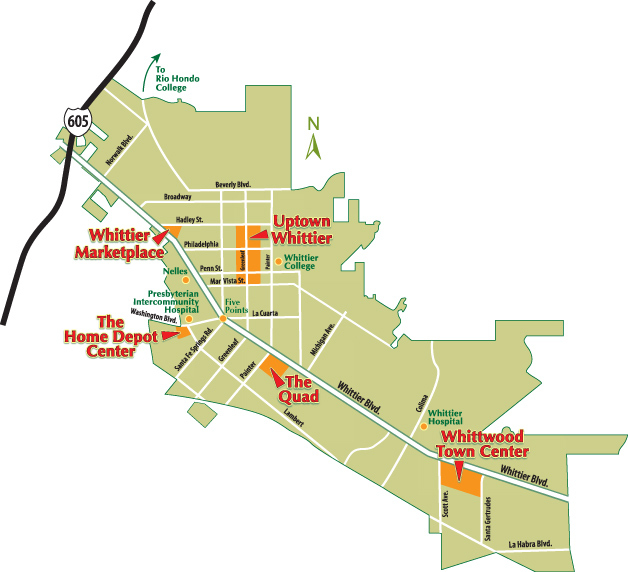 Whittier is a city in Los Angeles County, California about 12 miles (19 km) southeast of Los Angeles. The city had a population of 85,331 at the 2010 census, up from 83,680 as of the 2000 census, and encompasses 14.7 square miles (38.0 km2). Like nearby Montebello, the city constitutes part of the Gateway Cities. Whittier was incorporated in February 1898 and became a charter city in 1955. The city is named for the poet John Greenleaf Whittier and is home to Whittier College. Retail map shown on right.